Mayor William Martin says renovations are being made to transform the century-old former Lunt Silversmiths building into medical offices. 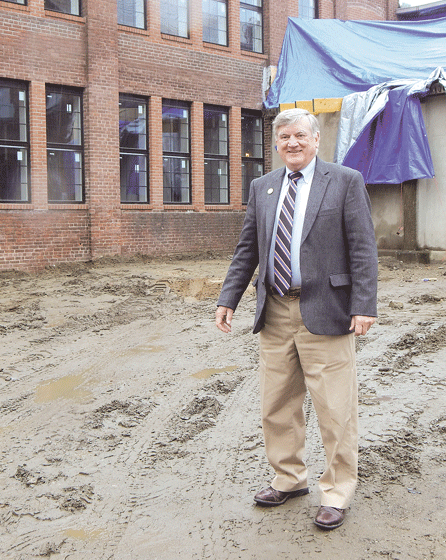 Mayor William Martin says projects that were started years ago are coming to fruition in Greenfield, and new ones are underway that will help the town continue down its path to independence, as well as addressing areas that need revitalization. The Town Council just approved a $5 million bond to create a municipal Internet, phone, and data-services company called Greenfield Community Energy and Technology (GCET) that will be paid for by the company after it is established. Free Internet service is being provided on Main and High streets until the project is completed, thanks to a $500,000 pilot program, and 82% of voters voiced approval for GCET, which will provide the bandwidth and speed needed to stay competitive and attract new businesses, as the town has lost some in the past due to a lack of technology. “We’ve been given the green light to move forward with this project,” Martin said, noting that, in addition, Greenfield Light and Power began operating as a municipal aggregation plan more than a year ago and brought not only lower-cost electricity to the community, but measures to procure the energy from renewable sources. “The company went online Jan. 1 last year, and now all of our electricity is 100% green,” the mayor told BusinessWest, adding that the public utilities will increase the likelihood of retaining businesses, encouraging them to expand, and enticing new businesses to move to the community. GCET will also allow the Greenfield School Department to administer the Partnership for Assessment of Readiness for College and Careers (PARCC) exam to public-school students; the test is aligned with Common Core standards and replaces the Massachusetts Comprehensive Assessment System (MCAS) test. Other compelling reasons for installing an up-to-date fiber-optic system include the fact that Greenfield Community College has a downtown campus, and the town established the Mass. Virtual Academy at Greenfield five years ago on Main Street, the Commonwealth’s first virtual K-12 public school. Public utility companies will play a vital role in maintaining the town’s independence, but they are only a part of other major initiatives taking place. The new, $66 million Greenfield High School opened its doors last September, and the new, $73 million Greenfield Trial Court is expected to open in October, benefiting downtown businesses and restaurants that suffered when construction began on the courthouse about three years ago and operations were temporarily moved several miles away. 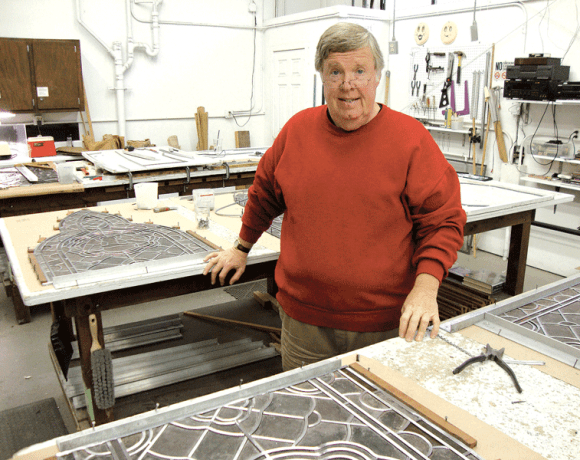 Martin told BusinessWest that, although some people over the age of 50 still think of downtown Greenfield primarily as a place to do retail shopping, that business has moved to malls, which makes developing a new identity critical to the neighborhood’s future. “Greenfield is fortunate to have maintained some of its luster and attractions that are extremely unique, such as the century-old Wilson’s department store and Gardens seven-screen cinema,” he said, noting that the downtown area also contains new ethnic restaurants as well as federal, state, and county agencies, including the courthouse, Baystate Franklin Medical Center, the county jail about a mile away, and the new, $14 million intermodal John W. Olver Transit Center that serves Franklin County Transit Authority bus routes and provides intercity bus service as well as a train station that houses Amtrak’s Vermonter line. The new, $60 million Greenfield Trial Court is expected to open in October and restore lost foot traffic to downtown businesses and restaurants. In spite of these major institutions, the temporary courthouse move did affect a number of downtown businesses. However, some made accommodations to make up for revenue that was lost, including restaurants that started delivery services. But when the Greenfield Trial Court opens next fall, the attorneys, courthouse employees, and people scheduled to appear in court are expected to help to restore the regional downtown center to its former vitality. However, city officials are well aware that academics, government, education, and manufacturing are the fast-growing industries in the Pioneer Valley. He added that the town’s focus on healthcare is exemplified by the planned development of the former Sears Department store into medical, dental, and professional offices. The Lunt Silversmiths property about 1.5 miles from Main Street is also undergoing substantial reconstruction for conversion to a residential medical treatment center of 65 beds operated by Behavioral Health Network and other clinics, which complements Greenfield’s regional position as host to Baystate Franklin Medical Center. “We’re actively soliciting medical groups,” Martin noted, adding that Patriot Care, which provides medical marijuana, has purchased the former American Legion building at 7 Legion St. just off Main Street, and is renovating it to suit its needs, and a former convenience store a half-mile from downtown was purchased by a cardiology practice with several hundred clients and is expected to open in June. Other efforts are being made to enhance the downtown, and last month the Town Council approved spending $4.2 million to build a new community center on a one-acre site a block from Main Street, which will serve as a senior center during the day and offer space for classes in the evenings and on weekends. Martin said a 100-year-old building on the site which currently houses the central office for the school department will be either demolished or converted to housing, and the office will be moved to the middle school. In addition, a central communications center for the county is in the planning stages, and will be located in a strategic area on West Main Street, which Martin describes as “an area that requires stimulation and planning with both private and public development. “It is blighted, so we want to fill it in and make it more attractive to stimulate further development,” he told BusinessWest, adding that a number of buildings there have already been demolished, redeveloped, or scheduled for major renovations or redevelopment. Town officials are also working to create a village of tiny houses, which are growing in popularity, on a ¾-acre lot at 102-106 Deerfield St. A bike path is situated to the rear of the lot, and a formal bike lane was established on Route 2 after the town adopted the Complete Streets program, a transportation and design initiative that promotes safe travel for walkers and cyclers. Greenfield also received a $177,000 grant to create a new dog park a short distance away at Green River Park off of Petty Plain Road, as well as a $400,000 PARC grant to install a new playground, signage, basketball court, and pickleball court and revamp the parking lot. Measures have also been taken to address flooding from the Green and Deerfield rivers on Deerfield Street, which have caused real problems in the past for Mohawk Meadow Golf Course and the Department of Public Works treatment plant. Streetscape and engineering work has been done to prevent future floods, including the installation of a unique set of storm doors on the DPW building. Martin added, however, that condemned properties with flooded basements are still monitored, while fire ravaged-buildings have been removed. Greenfield hopes to build a new library to replace the current structure on Main Street, built in 1880, which lacks the space and modern amenities needed to keep pace with today’s needs. A state grant was procured to pay for a design, and a forum was held last month to inform residents about evolving plans. 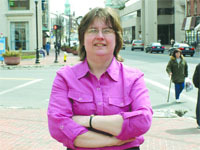 Martin said the town’s finances are in good shape, and it was fortunate to be able to negotiate contracts with the unions that will allow it to maintain a steady cost of living, while reducing the increase over time. Although the residential tax rate is high, he noted — Greenfield ranks fourth in the state in that category — valuations are low, so the average homeowner pays $3,934 in real-estate taxes, ranking 211th in the Commonwealth. So, the combination of new projects and long-awaited ones coming to fruition has officials excited about the future. 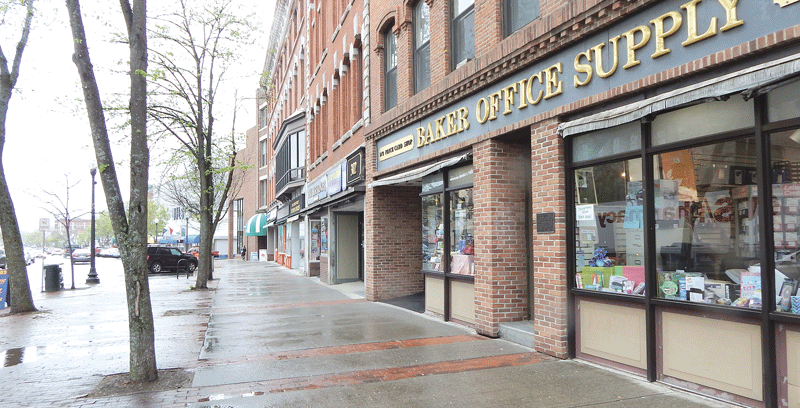 “We’re looking to continuously strengthen our unique approach to reframing Main Street, and our next step will be to make it an attractive destination for young people with curious minds,” Martin said, adding that the town hopes to open an innovation center and a program that would allow businesses to share services. He told BusinessWest that two manufacturing companies have plans to move Greenfield, and officials hope to build on the success of businesses that have been in town for years and work with the school department to shorten the path from graduation to job security. “We believe that municipal investment will act as a catalyst for private investment and set the town up to repair and replace institutional buildings and needed infrastructure,” the mayor added, noting that new sewer and water lines and pump stations are being installed throughout the town. Upcoming challenges will include a lack of parking when the new courthouse opens because it was built on a former parking lot. “But we’re looking forward to the revival of foot traffic, which will help downtown businesses, although things won’t really settle down until construction on a new multi-storied garage is complete,” Martin continued, explaining that strategies to deal with the issue may include measures such as a shuttle service to distant parking lots. But the town is keeping pace by installing utilities and technology that will keep it independent, attract young people, and offer businesses all they need to be successful in the years to come.